I often said to ex-Chief Superintendent Derek Gosse: "Let's have lunch at one of those wooden taxi shelters." He'd reply: "We will." But we didn't. Chief Superintendent Gosse, once boss of the Kensington police. retired and drove a black cab. Then he retired again - to Bognor Regis. 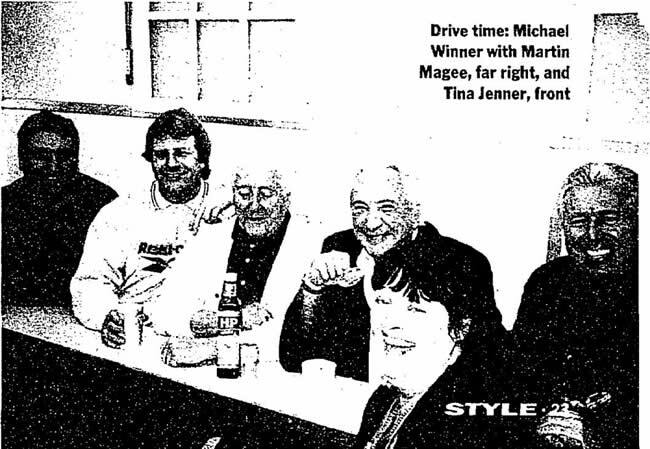 So I said to Martin Magee: "Let's have lunch in a London taxi shelter." Martin drives me sometimes when my chauffeurs off. First he had a gold Rolls-Royce (vulgar but comfortable). Then a large Mercedes (not so comfortable). Then an Asquith, a tall, repro 1930s taxicab, with wonderful high windows. That was the best. Now he works for an Arab prince (doesn't everyone? ), but occasionally drives his modern black cab. We set off for the Grosvenor Gardens taxi shelter, near Buckingham Palace. There's a "rest rank" outside, where drivers can park without having to feed meters. The shelters provide cheap food for London cabbies. They take 12 people on bench seats facing a narrow shelf from which they eat. The dining area's on the left as you enter, the kitchen on the right. Martin and I squeezed onto one of the benches. A blackboard menu showed pork chop, £4.50, and sausage and mash with onion gravy and beans, £4. I had a mug of tea (good) and ordered the sausage and mash. "What's the best thing about driving a cab?" I asked. "Freedom," was the general answer. "Picking up people," came quick as flash - followed by: "You can't park anywhere without a traffic warden sticking a £60 thing on you, even if you want a pee." The formidable chef-landlady, Tina Jenner, wore a green apron with white stripes. She offered cabbie Joe the stew he'd reserved from yesterday's menu. "It's better now, had time to mature," explained Tina, reheating it. "You ought to come in more often," a man said to me. "Tina ain't half talking proper today." "She's got her telephone voice on," added another. Conversation turned to a cafe that cab drivers used to frequent. "He got closed for rats." said Martin. "You're never more than 30 yards from a rat in London," someone said. Tina was a legal secretary before taking on the shelter two years ago. "She's also our mum," a cabbie explained. "She sorts out all the arguments." "What do you argue about?" I asked. "Football, politics, everything, the war." I didn't dare ask what war. My sausages arrived. They were enormously long. I'd like to say it was a wonderful dish, but it wasn't. The sausages were soft. Not a good taste and no crispness on the skin. Wall's pork sausages, Heinz baked beans, a fried egg on toast - that's a great meal. These beans were weak in colour and taste, not Heinz. The potato was Smash or something like it. The taxi drivers chatted about Danny the Docker, who used to be very fussy about what he did. "He works like a butter boy now," said Martin. "What's that?" I asked. "A cab driver who just got his licence," someone explained. Apparently, Danny's now working nights. They all agreed there weren't enough fares during the day and too many at night. After midnight they only get a 90p surcharge per fare. Most reasonably, they don't like working late for such a small bonus. I ordered Tina's home-made festive pie with ice cream. "She's worse than Gordon Ramsay when she gets the strop on you," a cabbie said. "He's a pussycat by comparison." My pie arrived. Where's the ice cream from?" I asked. "Asda," replied Tina. It was terrible. "Best ice cream in London's in Chalk Farm Road," volunteered a cabbie from the end of the hut. "Morelli's," said another. "You mean Marine Ices," I suggested. They agreed. "It is the best, you're right," I said. eating Tina's festive pie. This was sensational. Superb. At last, a triumph. It was a marvellous home-made pie with apple and raisins. I should have had an enormous portion of that and nothing else. "We'll now take a photograph," I announced. A cabbie shot up like lightning, leapt onto the table, and ran to get out of the photo. "He's afraid his ex might see it," said a cabbie. "Or the taxman," said another. "That man moans about illegal immigrants, he's not even legal himself," observed a third. The photo was taken by Two-Day Terry, so called because he only works two days a week. "He takes £600 though," said one of the cabbies. I had a very nice time. The company was great. "One cab driver looked in, saw you, and said, 'I'm going,' " Martin reported as I got into his cab. "No fool him," I replied. I am delighted that Michael Winner regards the glorified golfing shack at Sandy Lane as one of "his" hotels in Barbados (Style, Dec 31). At least if he stays there, there will be no danger of meeting him in the far more charming and civilised surrounding of the Cobbler's Cove Hotel, just up the coast. The food there is immeasurably superior to the bland fare of the Sandy Lane, the service polite and highly personalised, and the setting sublime. Please stay away, Mr Winner: we prefer our holidays without your preening and tantrums. We recently visited the newly refurbished Drones in Pont Street, London, after learning that Marco Pierre White had waved his magic spoon in the kitchen. We received a warm welcome - something sadly lacking in a lot of new smart restaurants - but found the food disappointing, and felt that some of the staff had an attitude problem. For instance, when one of our guests wanted to order red wine before he had selected his food (he only drinks red), the waiter questioned our right to order wine before choosing the food. The staff were in a hurry to take our orders, although it was only 8.30pm. My wife and I ordered the simplest meat dish - steak with snails and fries. The steak was tender, but the snails were like rubber and the sauce was so salty that we couldn't eat it. Our friends had pheasant, which came without the advertised bread sauce. When it finally arrived, it was slopped on top of the courgettes, which, again, were very salty. We left without trying the puddings. Some serious fine- tuning is needed here before we return. Poor old David Collins. In his review of Drones (Style, Jan 7), Michael Winner laid into the unfortunate interior designer for the umpteenth time in the past few years. Decoration is all a matter of taste, I suppose, but, surely, there must be some reason that his services continue to be sought by some of the best restaurants in London. I was very interested to see Terence Conran's letter to Michael Winner (Style, Dec 17). I didn't realise that Mr Conran could write. When I wrote to him two years ago about the worst restaurant experience my wife and I had ever had, which happened to be at Quaglinos, he didn't even bother to reply.